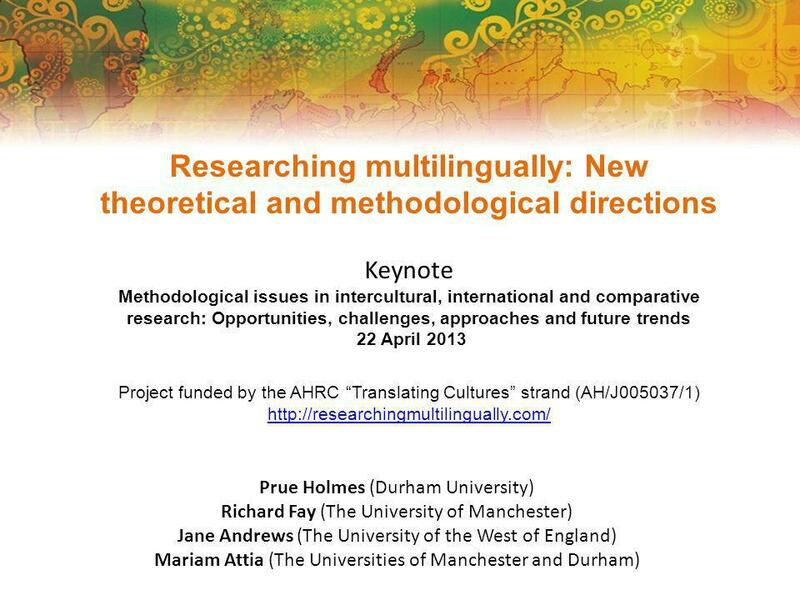 Researching multilingually: New theoretical and methodological directions Keynote Methodological issues in intercultural, international and comparative. 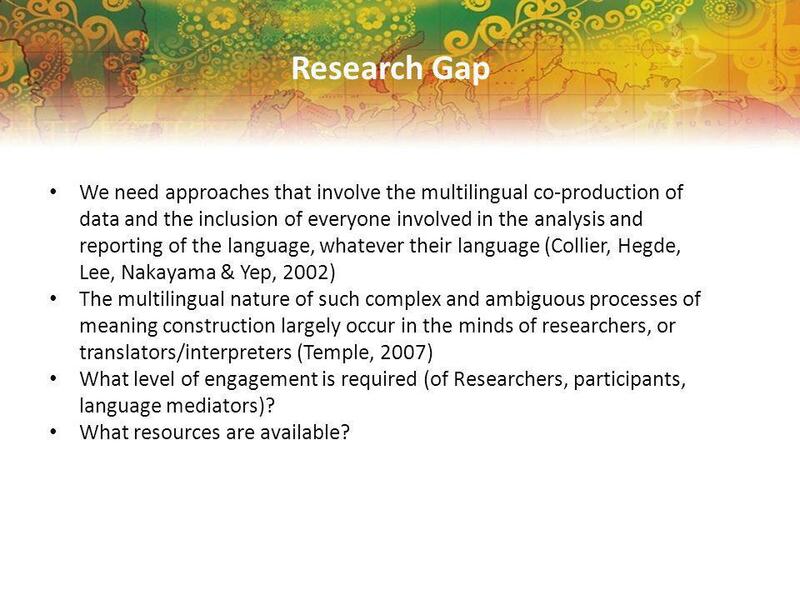 4 Research Gap We need approaches that involve the multilingual co-production of data and the inclusion of everyone involved in the analysis and reporting of the language, whatever their language (Collier, Hegde, Lee, Nakayama & Yep, 2002) The multilingual nature of such complex and ambiguous processes of meaning construction largely occur in the minds of researchers, or translators/interpreters (Temple, 2007) What level of engagement is required (of Researchers, participants, language mediators)? What resources are available? 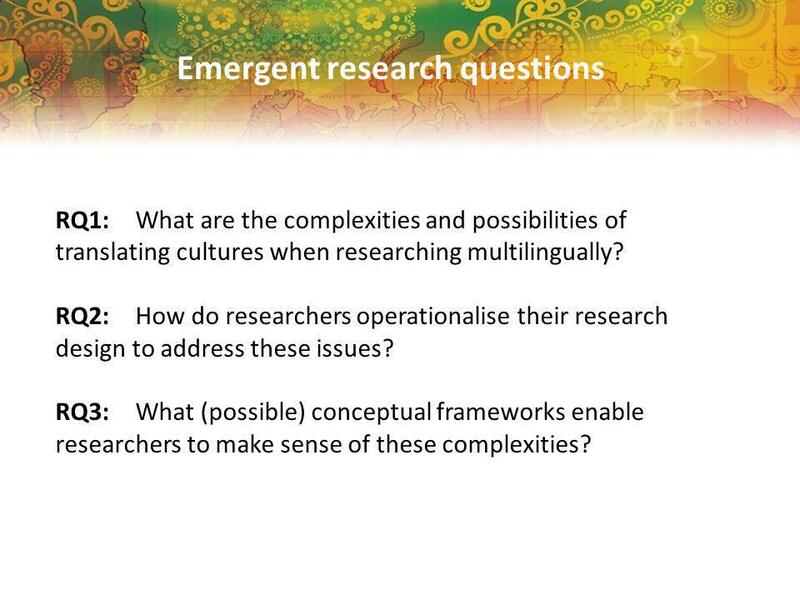 7 Emergent research questions RQ1: What are the complexities and possibilities of translating cultures when researching multilingually? 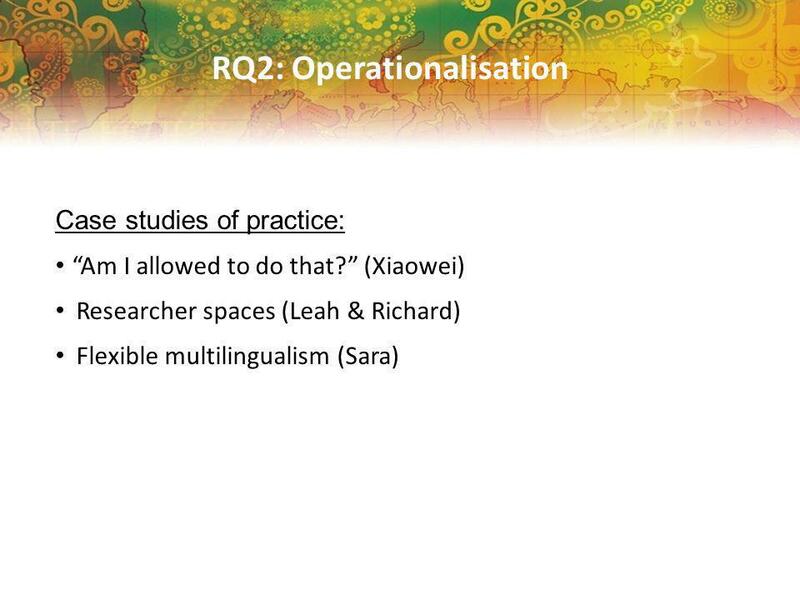 RQ2: How do researchers operationalise their research design to address these issues? 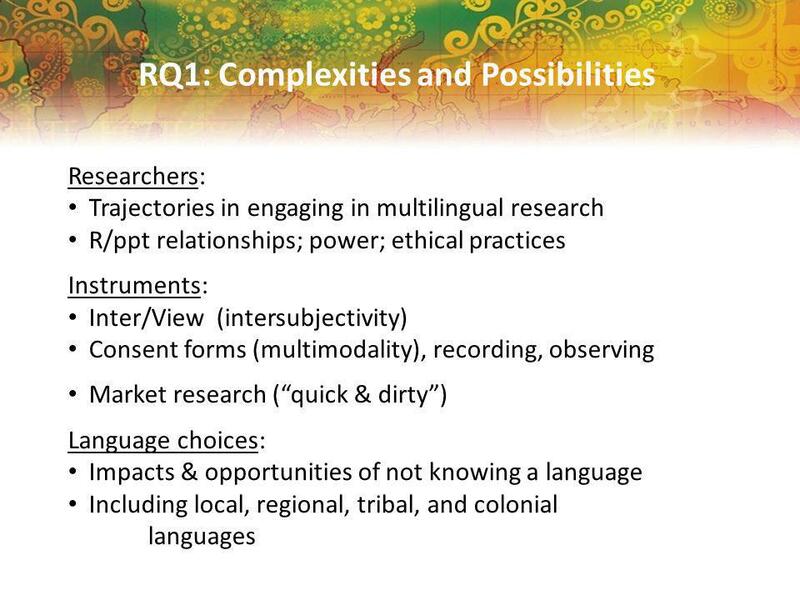 RQ3: What (possible) conceptual frameworks enable researchers to make sense of these complexities? 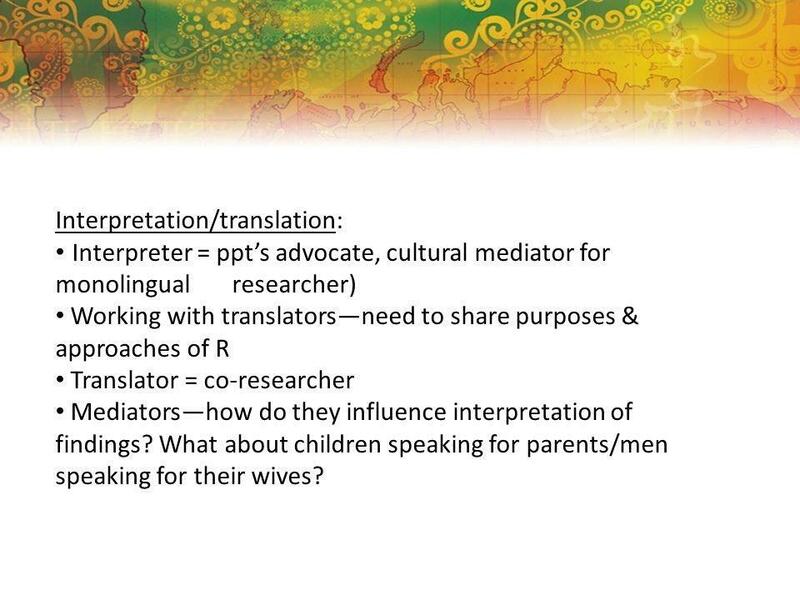 9 Interpretation/translation: Interpreter = ppts advocate, cultural mediator for monolingual researcher) Working with translatorsneed to share purposes & approaches of R Translator = co-researcher Mediatorshow do they influence interpretation of findings? What about children speaking for parents/men speaking for their wives? 10 Representation: Who is involved? When? At what level? 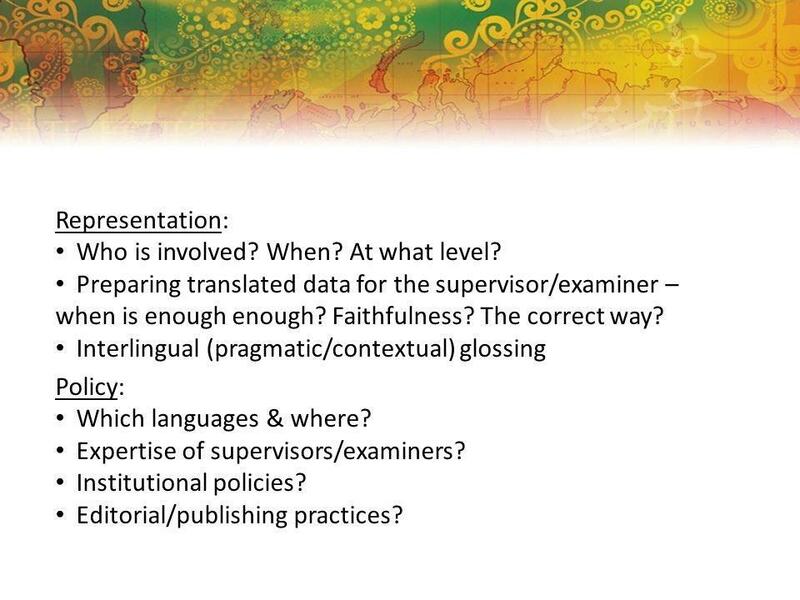 Preparing translated data for the supervisor/examiner – when is enough enough? Faithfulness? The correct way? 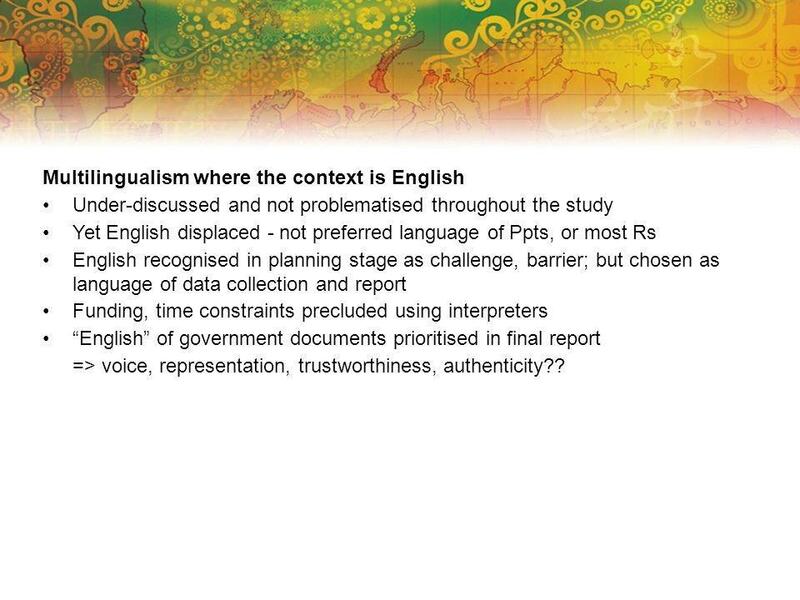 Interlingual (pragmatic/contextual) glossing Policy: Which languages & where? Expertise of supervisors/examiners? Institutional policies? Editorial/publishing practices? 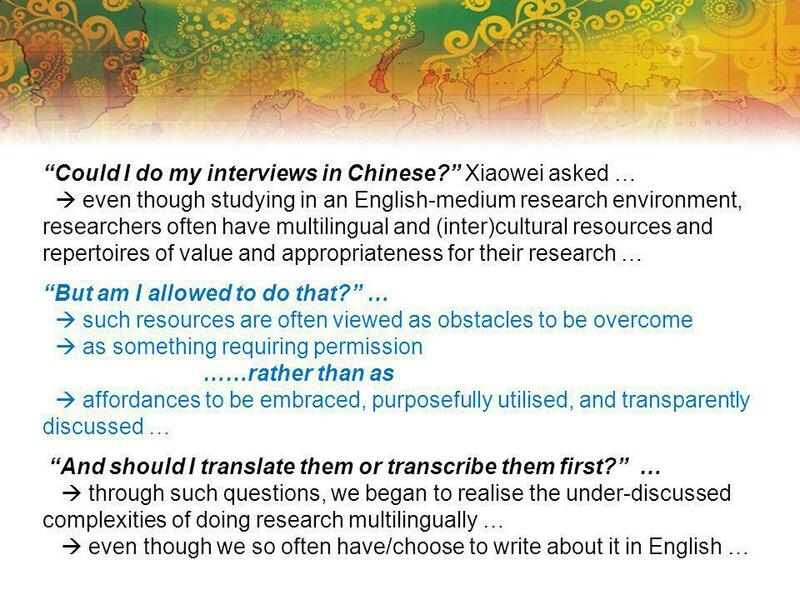 14 My exploration of the Mandarin-medium literature [re culture] As I set out on my study and realised the potential advantage of my bilingual background, I began to also explore relevant literature written in Mandarin. First, I examined the contemporary Mandarin-medium literature on – the Mandarin equivalent for culture and a phrase existing in Mandarin for more than two thousand years. 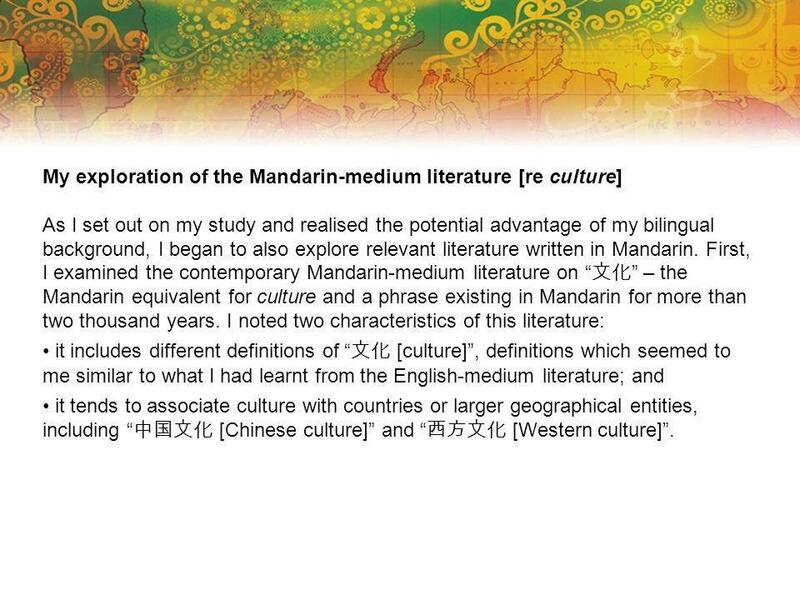 I noted two characteristics of this literature: it includes different definitions of [culture], definitions which seemed to me similar to what I had learnt from the English-medium literature; and it tends to associate culture with countries or larger geographical entities, including [Chinese culture] and [Western culture]. 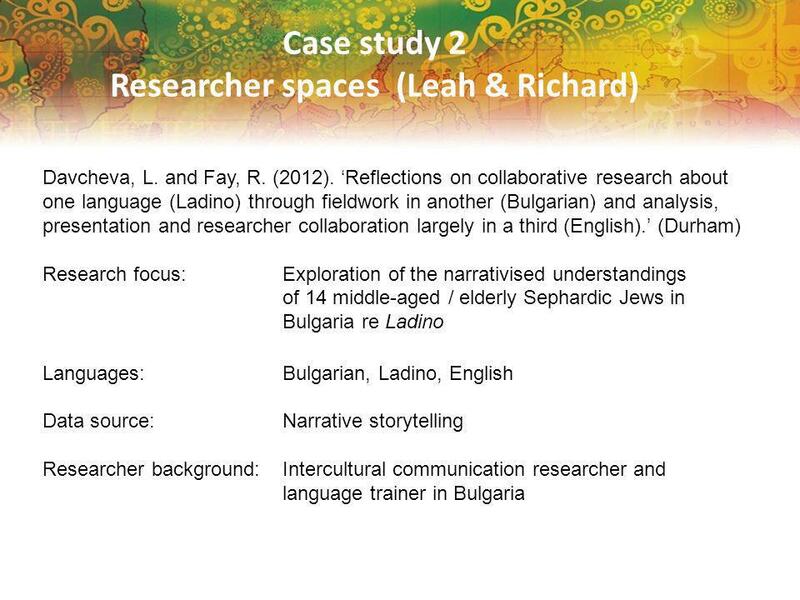 17 Four spaces for mapping the RM aspects of the study: the researched space (complex linguistic space in which Ladino functions co-territorially with e.g. 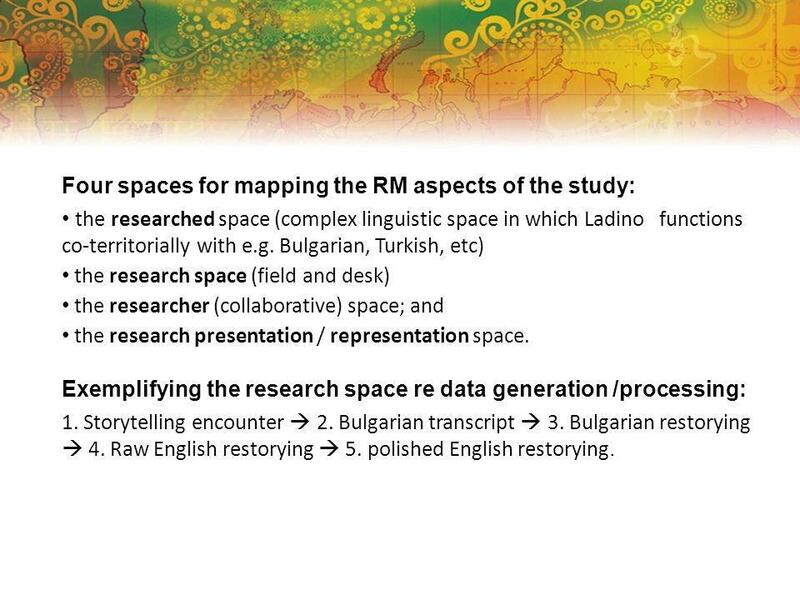 Bulgarian, Turkish, etc) the research space (field and desk) the researcher (collaborative) space; and the research presentation / representation space. 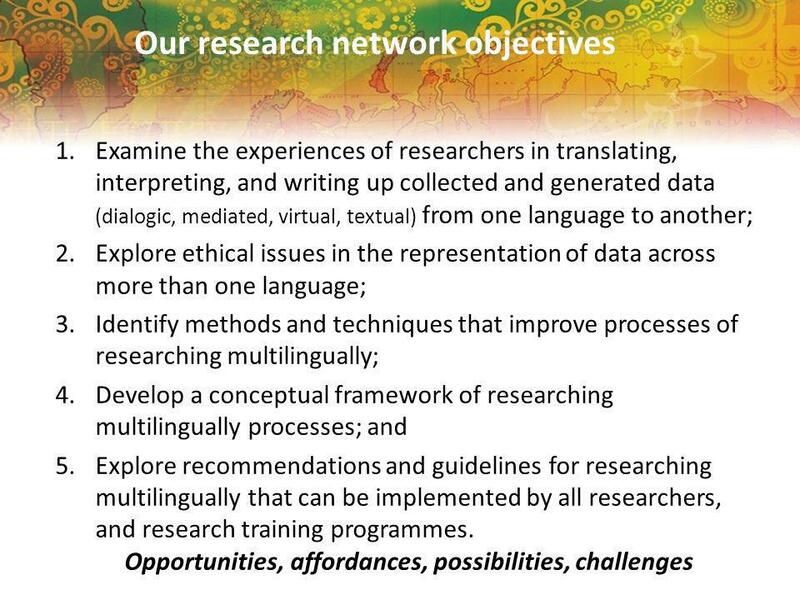 Exemplifying the research space re data generation /processing: 1. Storytelling encounter 2. Bulgarian transcript 3. Bulgarian restorying 4. Raw English restorying 5. polished English restorying. 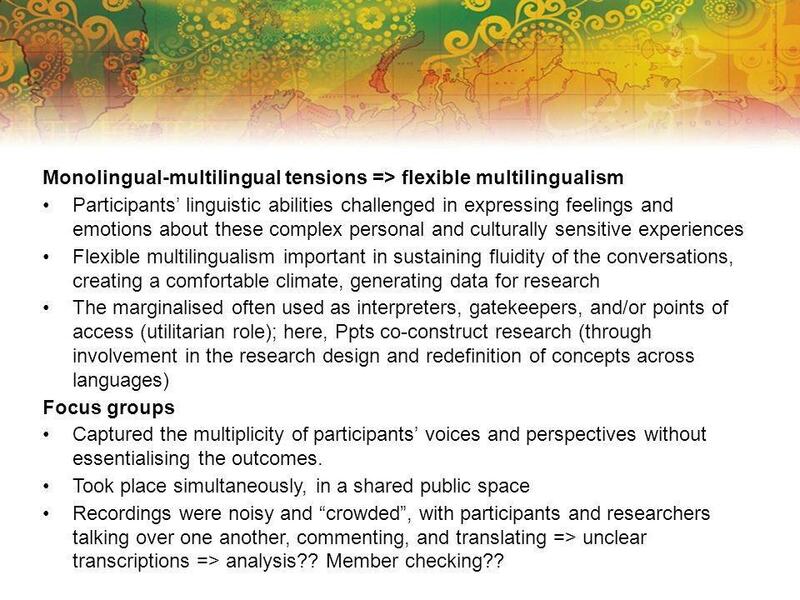 19 Monolingual-multilingual tensions => flexible multilingualism Participants linguistic abilities challenged in expressing feelings and emotions about these complex personal and culturally sensitive experiences Flexible multilingualism important in sustaining fluidity of the conversations, creating a comfortable climate, generating data for research The marginalised often used as interpreters, gatekeepers, and/or points of access (utilitarian role); here, Ppts co-construct research (through involvement in the research design and redefinition of concepts across languages) Focus groups Captured the multiplicity of participants voices and perspectives without essentialising the outcomes. Took place simultaneously, in a shared public space Recordings were noisy and crowded, with participants and researchers talking over one another, commenting, and translating => unclear transcriptions => analysis?? Member checking?? 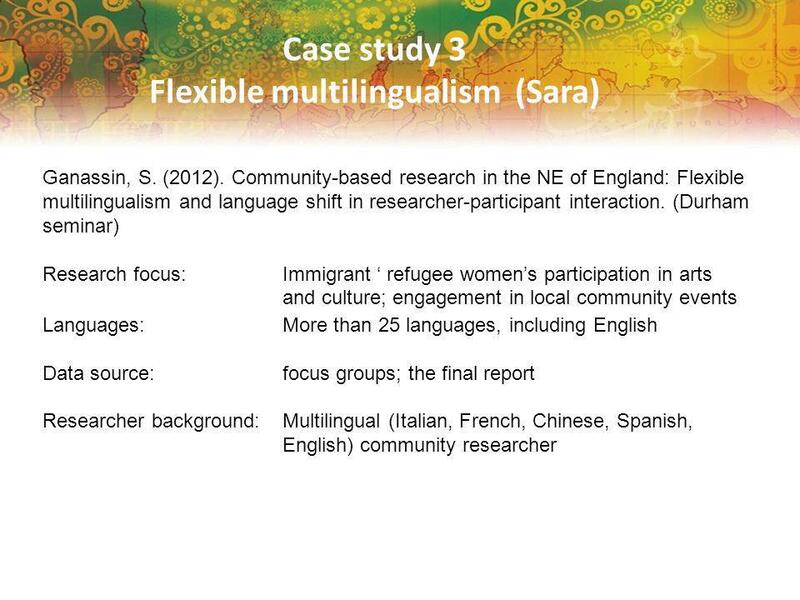 20 Multilingualism where the context is English Under-discussed and not problematised throughout the study Yet English displaced - not preferred language of Ppts, or most Rs English recognised in planning stage as challenge, barrier; but chosen as language of data collection and report Funding, time constraints precluded using interpreters English of government documents prioritised in final report => voice, representation, trustworthiness, authenticity?? 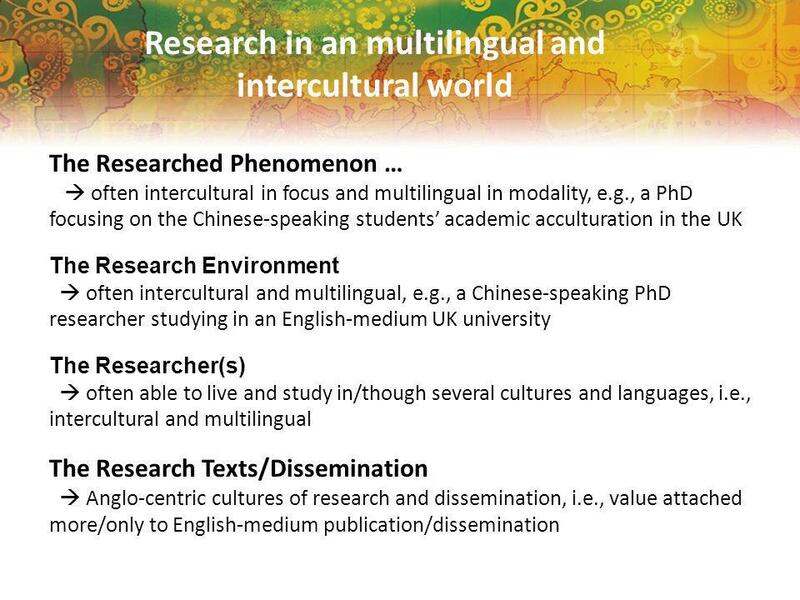 Download ppt "Researching multilingually: New theoretical and methodological directions Keynote Methodological issues in intercultural, international and comparative." 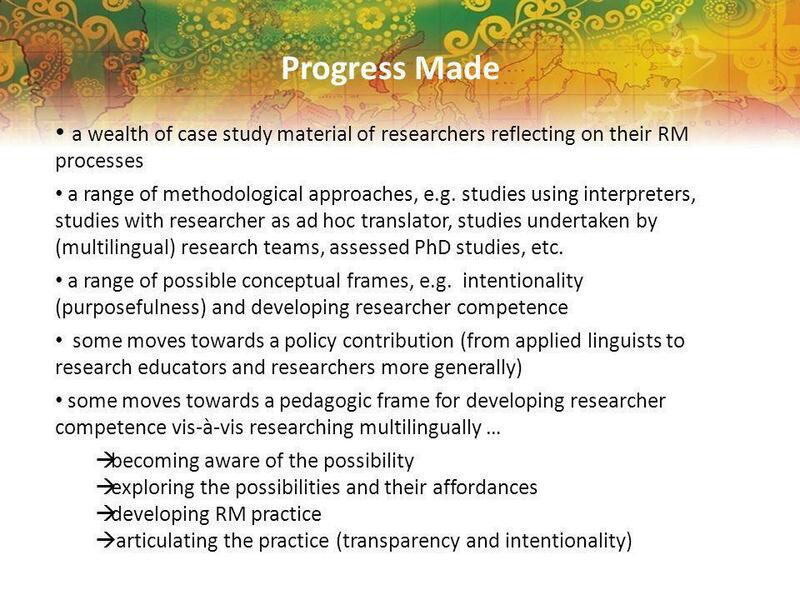 Acknowledging and making space for multilingual research design and practice: Towards a policy statement Paper 4 of the Mapping multilingualism in research. 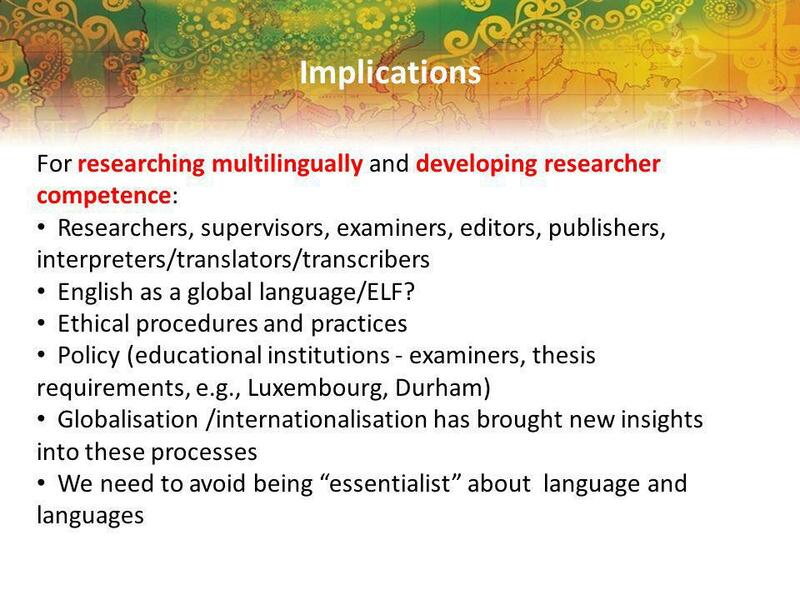 Researching Multilingually: Some Challenges and Complexities from Different Disciplines (CTIS Seminar, 7 th March 2013) Jane Andrews (The University of. Tracing researcher trajectories: the view from the AHRC research network Researching Multilingually Mariam Attia & Richard Fay BAAL Annual Meeting 2012. 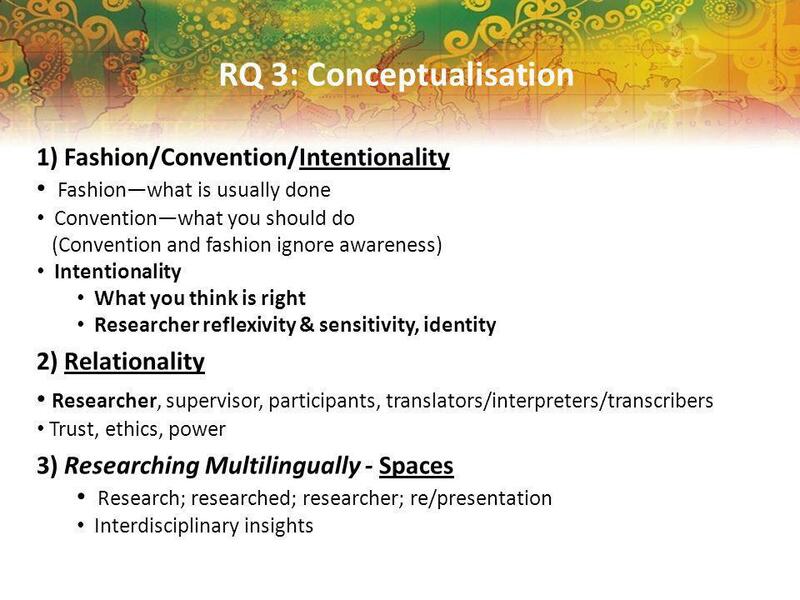 QUALITATIVE RESEARCH SOCIAL METHODS SC20062 Leah Wild Week Four. Year Two Year Three Year One Research methods teaching in the social sciences: An integrated approach to inquiry- based learning. 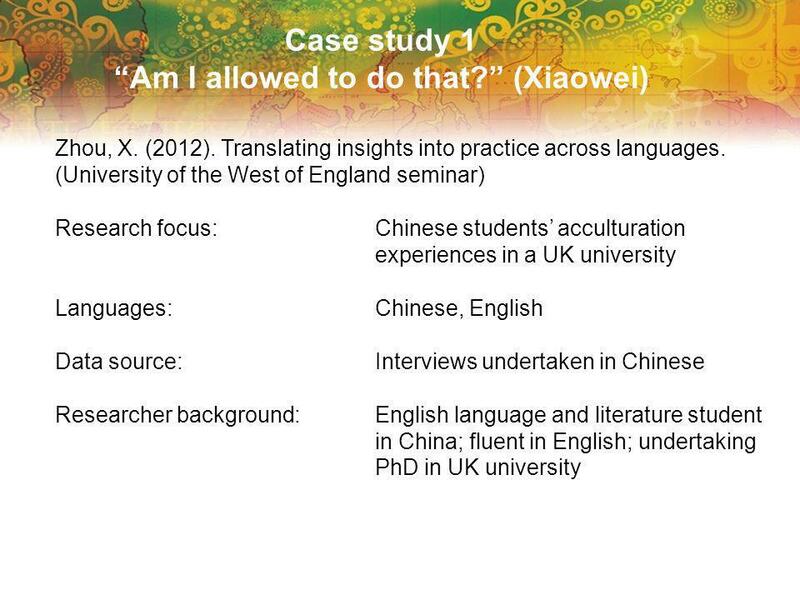 1 Richard Fay Xiaowei Zhou (‘Vivien’) Tzu-hsuan Liu (‘Carol’) School of Education, University of Manchester, UK. 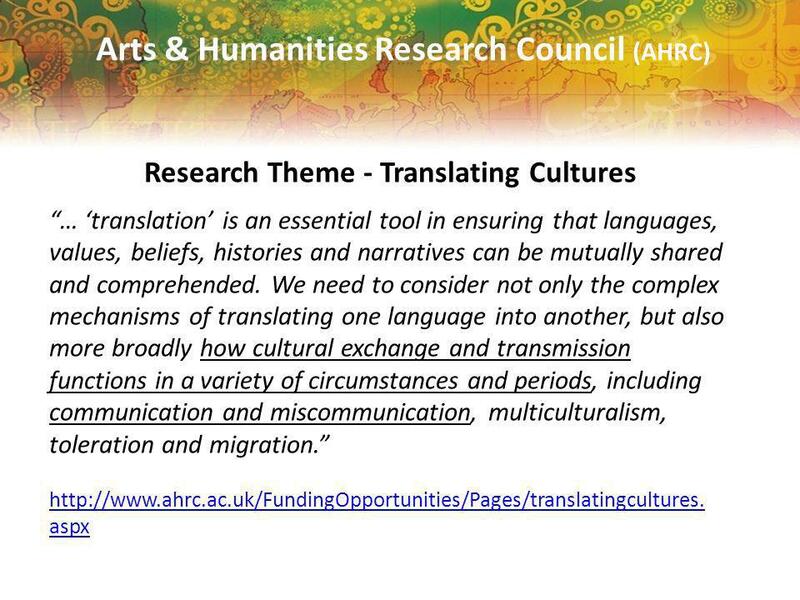 Researching interculturally, researching multilingually Researching multilingually: Methodological complexities and possibilities (AHRC-funded Network. 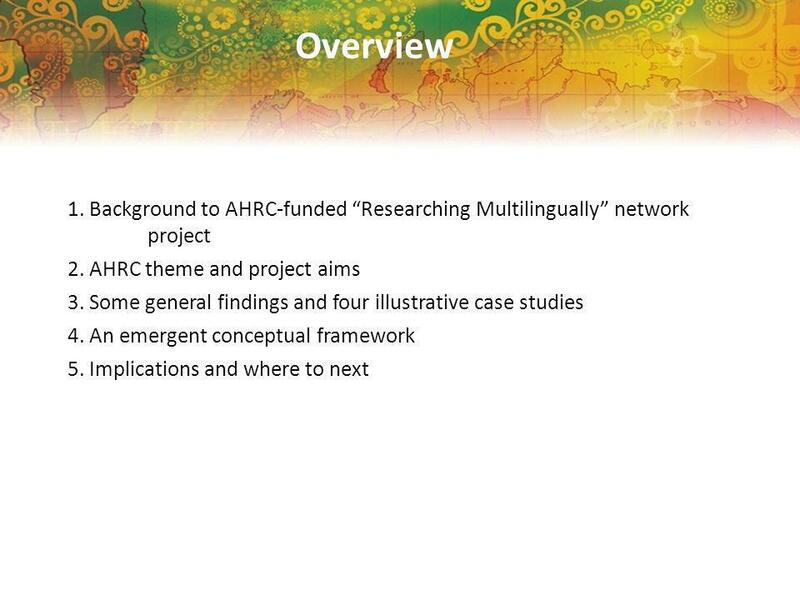 Researching multilingually: Methodological complexities and possibilities (AHRC-funded Network Project) Prue Holmes (Durham University) Richard Fay (The. 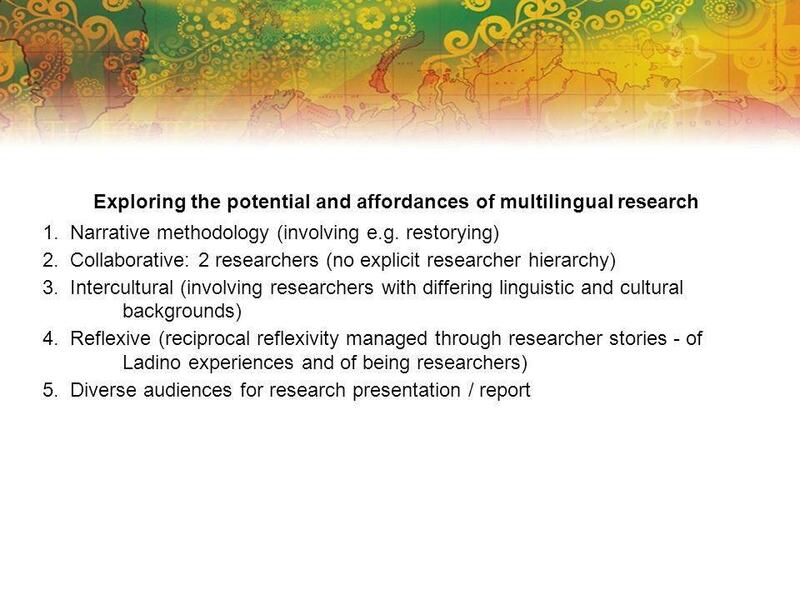 Establishing methodologies for researching multilingually ESRC final conference 26 th March 2013 Project funded by the AHRC “Translating Cultures” strand. Researching Multilingually at the Borders of Language, the Body, Law and the State An invitation for participation Mariam Attia. Open All Areas Partners: difficult to find them (internal and external) and to get them to commit, different goals, coordination of the cooperation, different.